Google is notorious for its abysmal support of Windows 10's app store. A quick search reveals that there are only two apps available from the company, both of which are called Google. One is for PCs and the other targets mobile devices. Neither is of any real value to Google users on Windows 10 though. If you want Gmail, Google Calendar, YouTube or Google Maps you will have to use the browser. However, there is a different story with Google Chrome. The browser just landed on Microsoft Store (Windows 10's app store), making it easier than ever to download it on a Windows 10 machine. That's the good news, anyway. 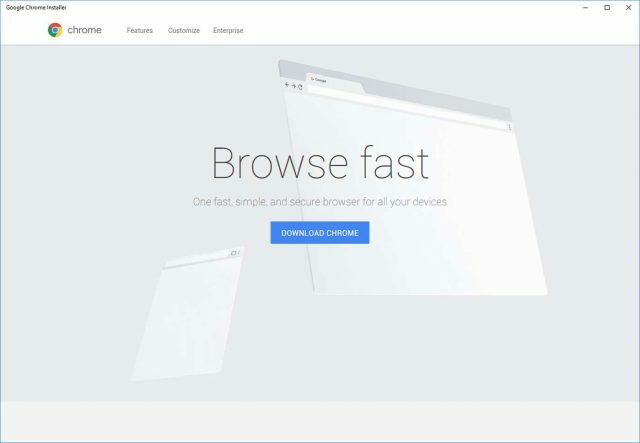 If you were expecting Google to offer a version of Chrome specifically tailored for Windows 10 users who prefer to use apps, you should know that this is basically just a launcher for the desktop installer that you can manually download from Google's site. So, when you install the aptly-named "Google Chrome Installer" what you get is a web wrapper for the download page, which gives you the ChromeSetup.exe file -- nothing more, nothing less. It's not exactly the sort of experience that you expect from a Google product as important as Chrome, but, quite frankly, it's better than nothing. The app does not show up in search results at this time, but you can get to it by hitting this link. Initial ratings are as you might expect: really low. The Windows 10 users that have tried it were probably expecting something a bit more worthy of such a popular operating system, which explains the two-star average. I would not be surprised if this is just an experiment so that Google can learn how much interest there is in store apps on Windows 10. If a significant number of users download Chrome perhaps Google will take things to the next level and come up with a more suitable incarnation of the browser. Update: The app is no longer available to download from Microsoft Store. The reason? "We have removed the Google Chrome Installer App from Microsoft Store, as it violates our Microsoft Store policies," says Microsoft.